The Manor of Lazaros Kountouriotis, great ship owner who played important political role to the rebellion, is located near the harbour and it is a typical example of a traditional Hydraian Manor. 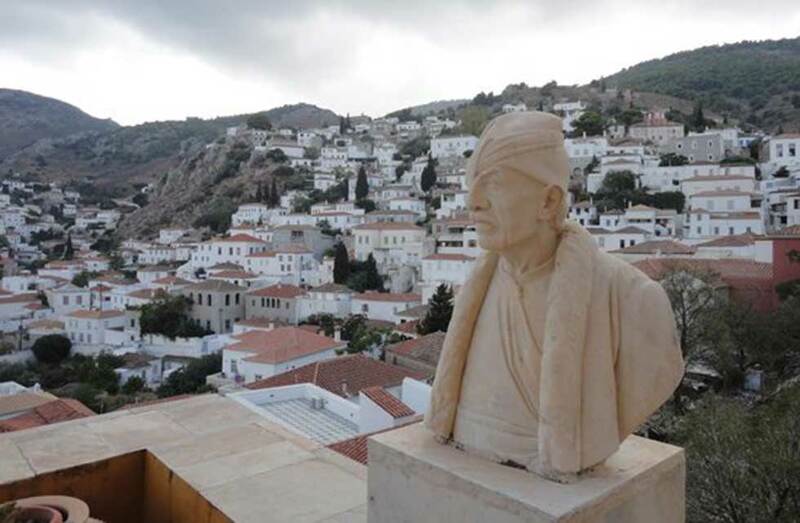 This Manor was used as an importand building for the Greek Revolution and also served as an accommodation to famous people at the time, greeks and foreigns. 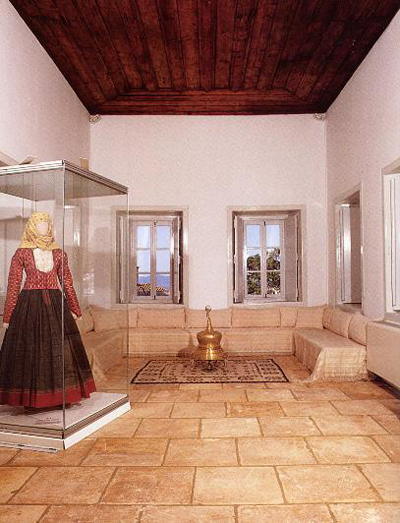 This Manor was donated to the Historic-Ethnologic Institute of Greece, by Lazaros Kountouriotis descendance. Today, it operates as an outlier of the National Museum of History. The Manor is divided into three levels. 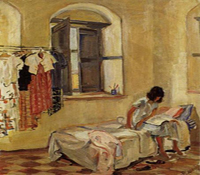 At the groundfloor, to the old cellars of the Manor, the visitor can see various painting from the artists Periklis and Konstantinos Byzantios both of them with tight ties with the Kountouriotis family. Periklis Vyzantios spent his life in Hydra as an Administrator of the Art School. 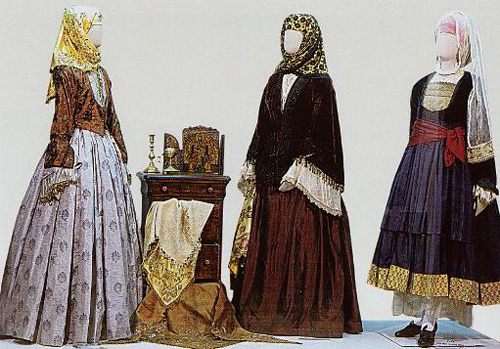 To the floor today there are exhibits of old furniture, mirrors, portraits and family heirlooms of the family Kountouriotis. The furniture brought from the East and the West, harmonically matched with local elements. Today, local sofas situated alongside European consoles and sideboards, wooden chests and double wardrobe, braziers and gilded mirrors, English and Italian dinnerware, nautical memorabilia, paintings and photographic family portraits, engravings struggle for independence, create a quirky but glamorous ensemble. 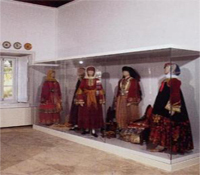 On the upper floor, finally, there are exposed historic and ethnographic collections of the National Historical Museum with representative works of Modern Art of the 18th and 19th century (the traditional island costumes, embroidery, textiles, jewelry, ceramics, decorative and other useful items), referring mainly to insular traditional art. Specifically, in this floor, there are exhibit works of modern Greek art (18th-19th century). Traditional costumes of the three prime maritime islands - Hydra, Spetses and Psaron, Skopelos, Skyros, Skiathos, the Astypalaias, Trikeri, Corfu, Chios, Kastelorizo and other Greek regions of mainland Greece - Ioannina, Veria, Kastoria. Jewelry, embroidery, weaving, pottery, chests carved or painted, are presented in the large bedrooms upstairs and reflect the social and economic conditions of that time, and the aesthetic tendencies, certainly result from the influence of Western European lifestyle. 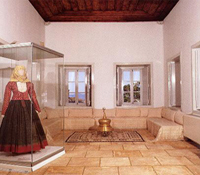 The attention of visitors is being attracted to the first room, to the attire of Lazarina (Stamatina) Kountouriotis typical of Hydra costume with dark green silk pleated skirt and silk cardigan, clothing of Helen D. Voulgaris, granddaughter of L. Kountouriotis the costume Spetses Mary Botassi, and the attire of Calliope Kotzia. 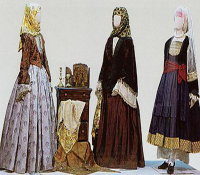 In the same area are presented and the famous Hydra scarves, creations of the female culture and sensitivity, dominated by that of Kiriakoula Kriezis, Honorary maid of honor of Queen Amalia. 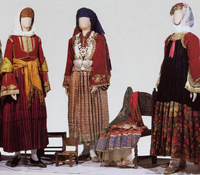 In the next room, the variety of jewelry and traditional costumes with particular interest from Northern Greece, Epirus, Attica and Mikra Asia. 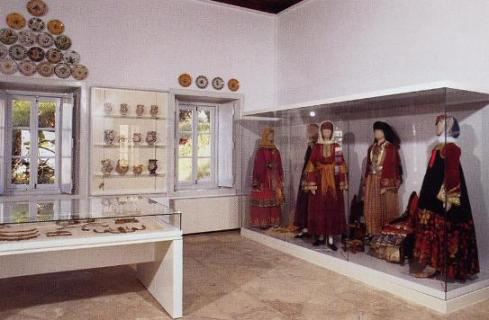 The interest of the visitor also attracts the great hall of the first floor, which is dedicated to the insular Greece and especially the central showcase of the hall, which exhibits excellent examples of Silversmiths, crafted with traditional techniques of forging, embossed, engraved , perforated, the filigree, enamels and niello. The colorful ceramic plates and bowls and jars from various regions of Hellenism give another aspect of island tradition referring to the interior of the Manor. 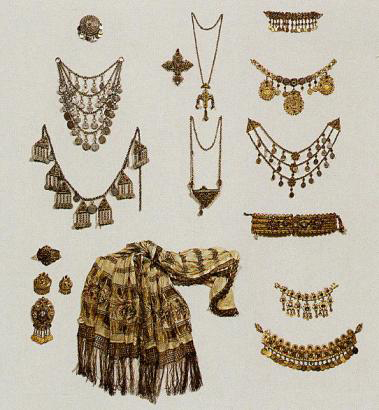 Particular impression caused by the showcase stating samples of silversmith, crafted with traditional techniques (forged, cast, embossed, etc.). 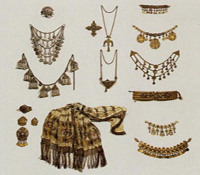 The jewelry-clasps, bracelets, earrings, brooches and jewelry is from Macedonia, Thrace, Mikra Asia, North Epirus and Attica. 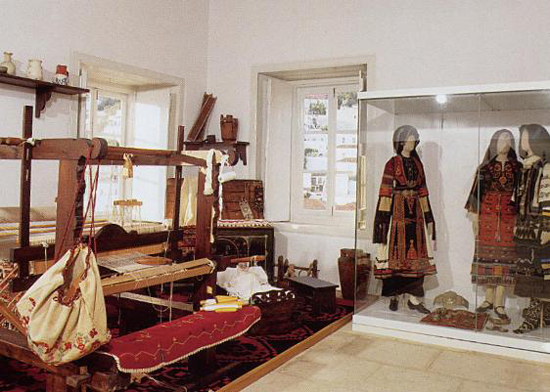 Modern Greek weaving represented in the exhibition by a carved wooden loom from Crete with various tools for processing wool as distaffs, shuttles etc. and excellent examples woven with colorful embroidery loom to decorate the house and dressing of the family. 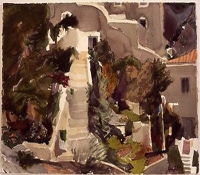 Also there are exhibitions of Hydra scarves, exquisite creations of artistic sensibility, and two painted woodwork pieces from the interior decoration of the mansion of George Voulgaris, which are excellent examples of wood carving, also there are also colorful ceramic plates and bowls , placed on the wall and are considered characteristic decorating in the island homes.